Photography that inspires the emotions of the human soul. Sometimes being a brother is better than being a superhero. 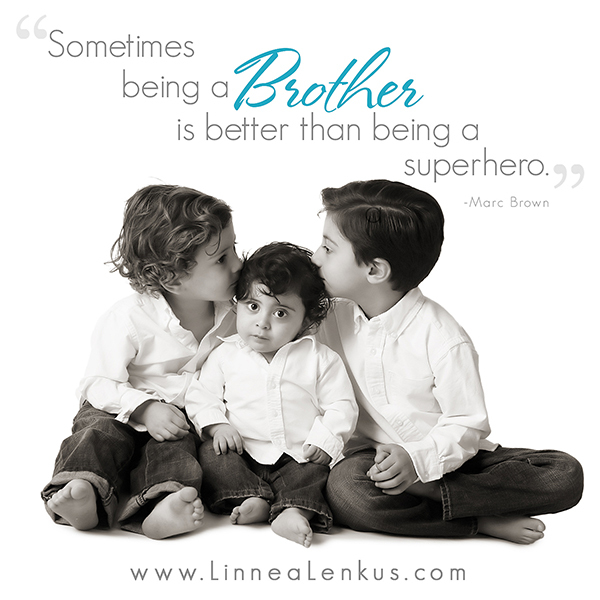 For quotes that are inspirational and memes about siblings, family and life set to the incredible portrait photography of Los Angeles photographer Linnea Lenkus, please click on the links to the right to inspire and motivate you! See a collection of Linnea’s fine art portrait photography on her main website. Did you fall in love with this sweet brother meme about superheroes? You will really love this family inspirational quote too. Linnea Lenkus specializes in Children, Family, Maternity, and Celebrity studio photography as well as Fine Art Boudoir photography. Linnea is a highly experienced, internationally published, professional photographer with worldwide commercial success. In a photography session with Linnea Lenkus, clients receive the benefit of her artistic eye and her technical mastery honed over decades of photography experience. Studio locations are in Long Beach/Signal Hill and Pasadena. We also have associate photographers that provide on location photography and service both the Los Angeles and Orange County areas. Linnea’s studio has a creative staff of specially trained photography experts who oversee every step of the process to ensure our clients have a thoroughly wonderful experience and receive incredible portraits of the highest quality each and every time. Call the studio for more information today. 562.981.8900 or 626.744.9104. Linnea Lenkus has been a photographer for over 20 years. She specializes in studio photography in Los Angeles, having 2 portrait studios in Pasadena and Long Beach. She is well known for her finer lighting techniques, the authentic feeling of her poses and for exceptional maternity, baby, child, coup lease and family portrait photography. Her boudoir photography is also exceptional with an edge towards an art gallery feel.